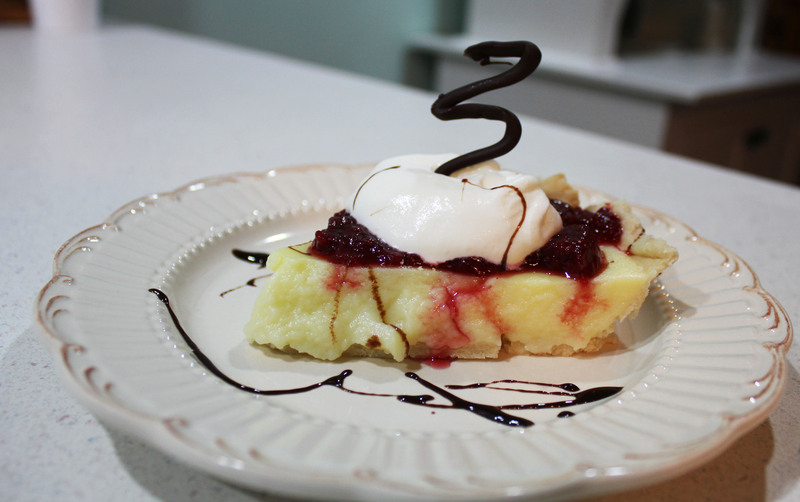 I found the recipe for this delicious pudding pie back when I was in high school. I wonder what the landscape of my life would be like now if I’d spent half as much time studying boys as I did cookbooks and wallpaper designs. Anyway, this recipe was in an ancient cookbook I found in the public library. A notation in it said the recipe was “over 100 years old” so goodness only knows how old it really is. I mean, like, my high school days were a while ago, dude. This pie filling is really simple to make and always delicious, so I’ll try to stick to the important facts from here on out. You can serve it plain, top it with fruit and whipped cream, give it a fluffy meringue topping, fill cream puffs or even alter the basic recipe by withholding the lemon and adding a little cocoa powder for a chocolate filling. The recipe was titled “Ruby Feaster’s Prize Cream Pie.” I have no idea who Ruby Feaster was, but she did make a delicious pie filling. 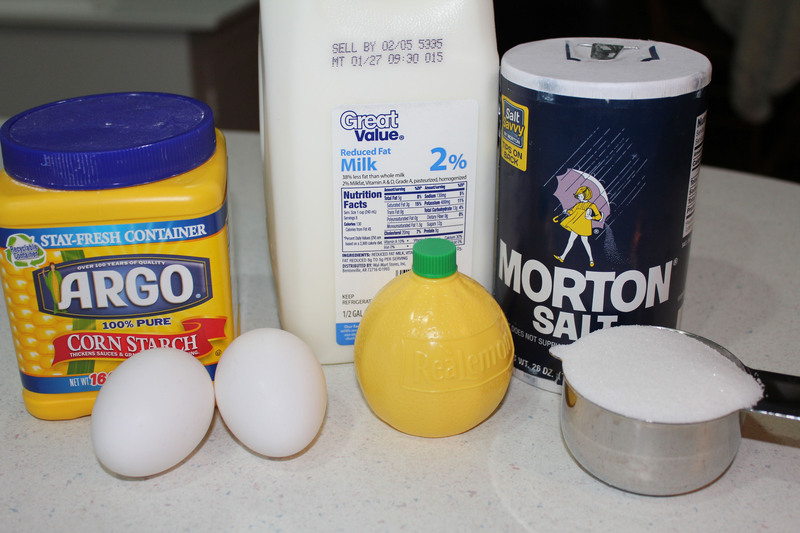 Ingredients for the filling. I tweaked the recipe a little over the years and this is what I’ve found works best. Beat the eggs slightly, just to break them up, add all the ingrients except for the lemon juice then cook over medium heat in a heavy saucepan (double-boiler if you don’t have a heavy pan) until thick. Make sure you stir the filling constantly so it doesn’t stick. Scorched pudding is not so tasty, not that I’ve ever done that sort of thing. 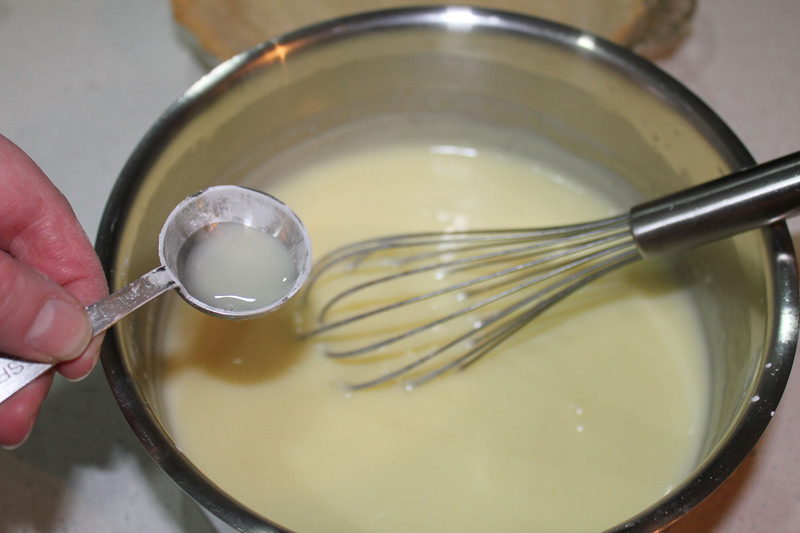 Add the lemon juice when it is cooked and stir it in. 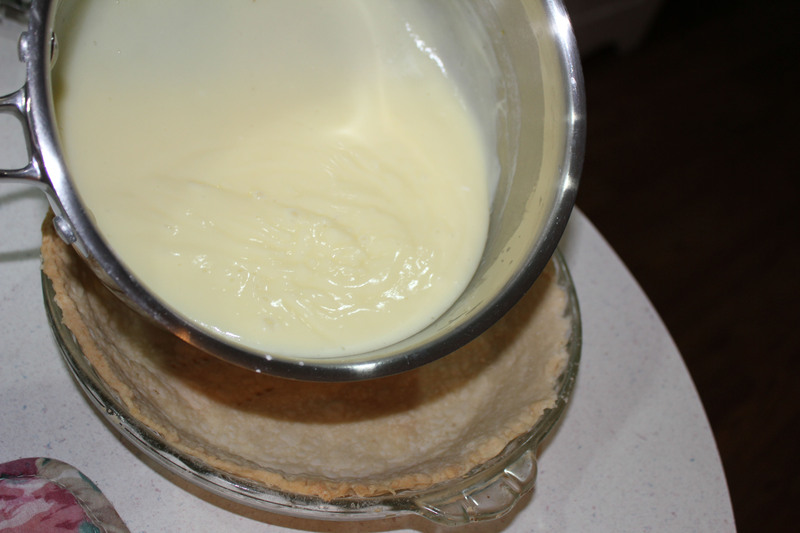 Pour filling into a pre-cooked pie shell. Let cool completely. Top with whatever fun accents tickle your taste buds and enjoy! 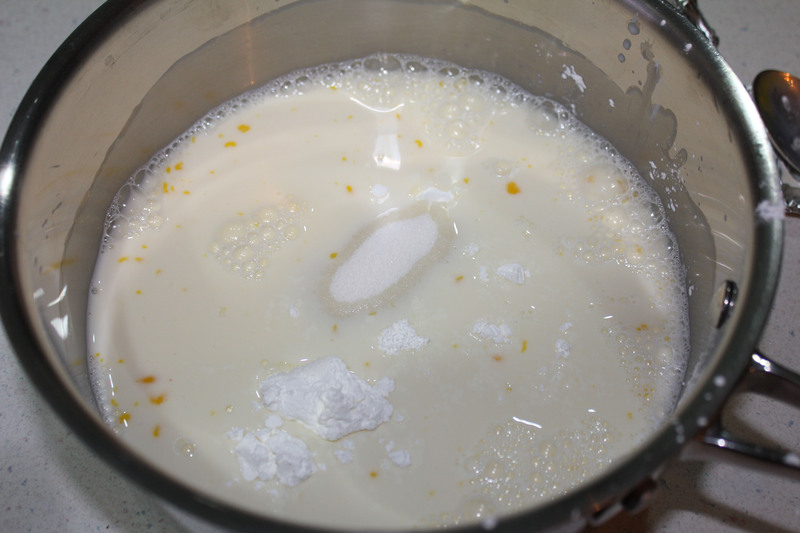 In a heavy saucepan, beat eggs, just until broken up, then add milk, sugar, cornstarch and salt. Cook over medium heat until thick. (If you don’t have a heavy saucepan, use a double boiler). When it starts to thicken you need to stir constantly. 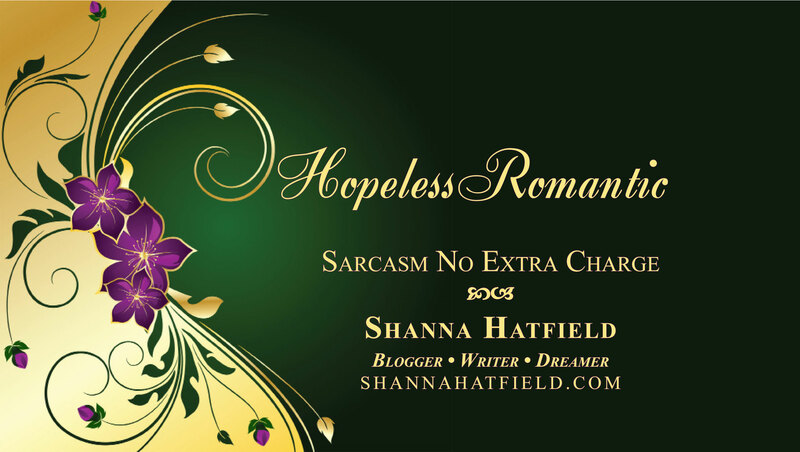 This is not the time to start daydreaming about the hunky hero in the novel you’re writing or the hunky hero who will soon be home, ready to eat the pie. (Not that this ever happens to me.) Pay close attention so you don’t scorch the pudding. When it starts to get a glossy sheen and is nice and thick, remove from heat, stir in lemon juice and pour into prepared pie shell. Cool completely. Top with whipped topping and a fruit garnish and enjoy!